A new tool has been released that untethers existing tethered jailbreaks for iOS 5.0.1. This means that if you are using a tethered jailbreak right now, you can download a free package from Cydia to untether your jailbreak and never have to boot with redsn0w assistance again. The package is called Corona and it’s very easy to install. The current version of Corona untether is compatible with iOS 5.01 on iPhone 4, iPhone 3GS, iPod touch 3rd or 4th gen, iPad 1. The iOS device will now be untethered, able to reboot at will without connecting to a computer. 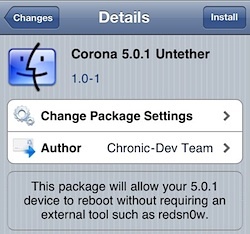 If for whatever reason you don’t want to use Corona, you can also download the untethered redsn0w and jailbreak iOS 5.0.1 untethered by running the new version over an existing tethered base, but that is more work than necessary. Corona is by far the easiest choice, and unless you plan on performing a clean installation, it’s the way to go. note:the requested modifications cannot be applied due to required dependencies or conflicts that cannot be automatically found or fixed. Yo estoy teniendo el mismo problema…no me deja instalarlo, lo he intentado varias veces….Saludos.! Im having the same problem on an iphone 4 i go to do the jailbreak get to the first stage and then it says waiting fro reboot and it boots normally. Is there something I’m doing wrong and is there a way to get this to work. Is it work for ios 5.0 tethered jailbreak (not 5.0.1)? Very easy upgrade using Corona. I’m currently using ipod touch 3rd gen and it is ios 5.0 tethered jailbroken, also im currently updating to ios 5.0.1 on itunes, after the update. is it safe to jailbreak using corona? thanks! This is amazing. I am now going to jailbreak my iphone. i have semi-tethered ios 5.0. Do I upgrade to 5.0.0 from the iphone first or what should i do? I was dreading the long task of backing up, restoring and jail breaking again when I came across this page. will i lose all my data from the previous jailbreak? I downloaded and installed Corona. I rebooted and now I’m stuck with the apple logo. I tried to boot with redsn0w and i get nothing. HELP! cydia wont even load, wtf? is there a certain source that you need 2 add to get corona??? If your iPod is jailbroken, already. 4.2.1, how can you jailbreak it to 5.01? Plus, does this really work?! Or, is this just a scam….? can i use this on a iphone 4 with ios 5.0 software?